Car and Bike wash shampoo: Evershine Car wash shampoo is made of premium quality ingredients, does not harm the human skin, paints and the metal of the cars. Gloss of the car is immediately restores after cleaning. Evershine Car wash shampoo can be used for cleaning alloy rims and rim covers also. It can also be used on all kinds of painted surface like scooters, bikes, refrigerators, Furniture painted door and walls. Evershine Car wash shampoo contains special fine fragrance to reduce surface smell when the water is used in circulation. Direction For Use: Evershine Car wash shampoo can be used by machine or manual applications. Dilute 1 part of Evershine Car wash shampoo to up to 50 parts of water. 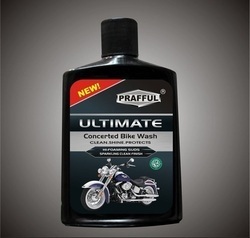 We are offering the best quality of Bike Wash Shampoo to our customers.